Welcome to the home of Chinewrde Morris Dancers! 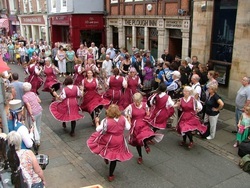 Based in Kenilworth, Warwickshire, Chinewrde have been dancing North West Morris for over 30 years. We are renowned for our energetic and precise dancing style, as well as our distinctive burgundy dresses. As well as running weekly practices, we have danced throughout England, from early evening dancing at local pubs to prestigious folk festivals such as Sidmouth Folk Week and Whitby Folk Week. Please have a look around our site and don't hesitate to contact us. We are a welcoming, family friendly side who are always happy to have new members. We have a Facebook page called Chinewrde Morris and there are various videos clips of us on YouTube.